Happy Wellness Wednesday! We've got a great recipe to answer that nagging question, "what's for dinner?". It's Cashew Chicken! Chicken is an excellent source of lean protein and cashews provide healthy fat. This recipe fits into heart healthy and diabetic meal plans. One serving contains less than 100mg sodium, is equivalent to two carbohydrate exchanges and is under 300 calories. The recipe calls for toasted cashews. 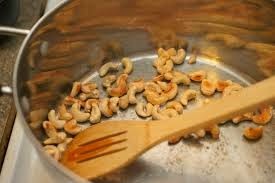 To toast cashews start out by spreading in a single layer in a skillet. Simply cook over medium heat for 1 to 2 minutes stirring frequently, until nuts are lightly browned. Remove immediately from skillet and you're ready to go! 1. Place chicken in a large resealable food storage bag. Whisk cornstarch, wine, soy sauce and garlic powder in a small bowl until smooth and well blended. Pour into bag with chicken. Seal bag and marinate in refrigerator for 1 hour. 2. Drain chicken; discard marinade. Heat oil in wok or large nonstick skillet over medium-high heat. Add green onions and cook while stirring 1 minute. Add chicken, cook and stir 2 minutes or until browned. Add mushrooms, bell peppers and water chestnuts, cook for another 3 minutes while stirring. Vegetables should be crisp and tender and chicken cooked through. 3. Serve chicken and vegetables over rice, top with cashews. We hope you will incorporate this recipe into your weekly meal plan. By having a menu set for your week it makes grocery shopping and meal preparation much easier. A meal plan or weekly menu helps us to stay on track with healthy eating and avoid reaching for convenience foods or detouring through the fast food drive through. Happy Mommy Monday! I thought I'd start your week of talking about probiotics. I feel like they're one of those hot topics that you hear about... but not everyone is really sure what they are and what they do. Let me enlighten you. Probiotics are a dietary supplement (sometimes food) containing live bacteria or yeast that supplements normal gastrointestinal flora. Basically what that sentence means is they're "good" bacteria that live in your gut. Quick science lesson: there's bacteria everywhere. Some is good and beneficial, others are bad and cause us to get sick. When everything is balance that is when we are the healthiest. Probiotics are used to help keep your good bacteria supply up... especially for times when you're on things like antibiotics. Antibiotics kill all bacteria, even the good kind. That's why sometimes when you're on antibiotics you might get diarrhea or even a yeast infection, the good bacteria that is usually there helping to keep you healthy has been killed. You don't need probiotics for your body to go back to normal, but it could help speed up the process or help you to not even get sick in the first place. Side note: I want to take a second to talk about PREbiotics. Confused? PREbiotics are foods that stimulate good bacteria growth. PRObiotics are basically just the bacteria that you put into your gut through supplementation or eating fermented foods. Examples of PREbiotics are oats, bananas, onions and even some honeys. Okay, back to probiotics. 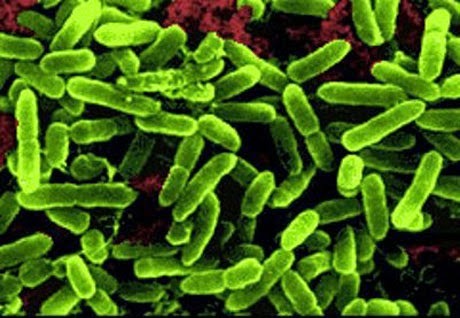 There are two main types of probiotics: Lactobacillus and Bifidobacterium. There's other types, but these are the most studied and found to be the most beneficial. The World Health Organization (WHO) states that probiotics, when administered in adequate amounts, confer a health benefit on the host. Here's the thing... we still don't know a ton about these things, but we do know that there is evidence that supplementing with probiotics can help your gut health. Diarrhea, constipation, and IBS all have strong evidence showing that the use of probiotics is beneficial to these conditions. There is no FIRM evidence for the rest of the claims with probiotics, BUT..... there are studies showing promise in children with colic, reflux, respritory infections, UTI's, allergies, asthma, eczema, colitis, and even Crohn's disease. What does that mean for you as a parent? If you have a child that (or even you yourself) struggles with one or more of these conditions, probiotics may be beneficial for you. It also means if you or your child struggles with constipation or diarrhea, these definitely could benefit you. So here's your next step... talk to your pediatrician and see if they feel supplementation for your child is the right thing to do. I can tell you personally that my son struggled in the beginning with his gut health. My pediatrician was very helpful and told me to start supplementing with the probiotics and to follow the dosage instructions on the bottle. Make sure if you have an infant you're using the infant probiotics and if you have an older kid you're using the children probiotics, specifically for the dosage information. It made a world of difference for us. It is important to note that the FDA does not regulate probiotics, so do your research, talk to your doctor, and buy a reputable brand. If you don't feel comfortable giving your infant probiotics and you're a breastfeeding mom, I have good news. You can take the supplement yourself and your baby will reap some of the benefits through your breastmilk. You can also up your intake of yogurt, sauerkraut, cottage cheese, and kombucha however, the amounts of probiotics aren't as strong as taking a supplement. And, just in case you were wondering what the Academy of Pediatrics has to say about probiotics... in 2010 they stated that they are generally safe, but they are unsure of what the long term effects or their effectiveness are. I have a feeling as more and more studies are done we will be pleased with the evidence that we get concerning these little bacteria. In closing... I'm not saying probiotics are a cure all... but it wouldn't hurt to talk to your pediatrician and see if supplementing could be beneficial for you, your kids and your guts. Soy protein is the only plant protein with all eight essential amino acids, making it equivalent to animal protein. It’s a lean, green, protein machine. 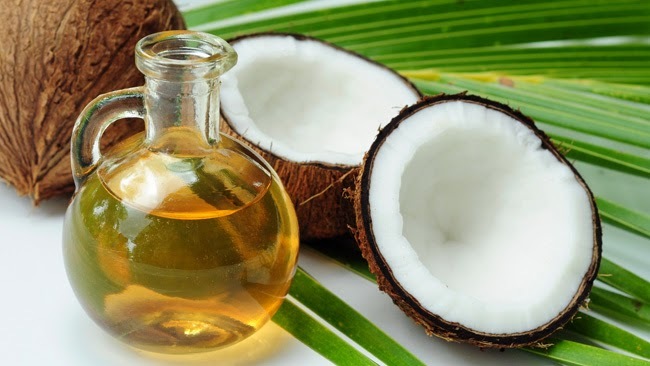 - Rich in health promoting bioactives, such as isoflavones, saponins and phytosterols, as well as the omega-3 fatty acid ALA.
· Phytoestrogens—isoflavones in soy and other plants—possess antioxidant and antimicrobial properties. They are the source of much past confusion over soy safety; however, research confirms their safety in humans. Phytoestrogens are structurally similar to estrogens, but act differently and are much weaker. · Soy is beneficial for athletic performance and muscle recovery, and is rich in antioxidant compounds that may help reduce oxidative stress associated with exercise. Soy protein provides an “intermediate” rate of amino acid release, and when combined with other proteins, such as whey and casein, offers a sustained delivery of amino acids to muscles. · Studies show moderate intake of two to three servings of soyfoods a day are safe. o A serving is: 1 cup soymilk or cultured soymilk “yogurt”; 1/2 cup cooked soybeans, edamame, tempeh or tofu; 1/3 cup soynuts; a soy-rich nutrition bar; or a veggie burger.